We have built numerous performance cars for ourselves and our customers, here are a few examples. 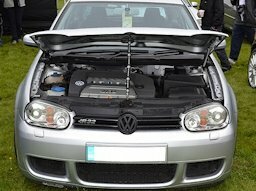 This car was built by the owner of VAG Auto Care Services and can regularly be seen during the UK car show season at such events as Harwood House, GTi International etc. This car has been through various states of tune and has a high specification which improves year on year, some of which is: HGP GT-35 Turbo charger, 3.5" custom exhaust system built in house, HGP competition twin side mounted intercoolers, custom stainless steel heatshield, custom downpipe, uprated injectors, race grade con rod bearings, custom HGP ECU software mapping, and water methanol injection. To cope with this high power output the car has a lengthened ratio 02M gearset and the chassis has been upgraded with polybushes, Neuspeed anti roll bars, Bilstein suspension, adjustable rear tie arms for camber correction, Audi B7 RS4 front brakes and Audi RS4 rear brakes. 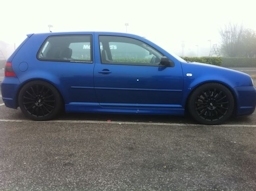 This car has also been converted to a US spec interior and had a rear seat delete as it is not a daily driver. 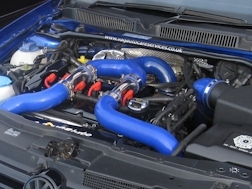 The engine is currently producing 520 BHP and is capable of running the quarter mile in around 11 seconds and was completely built in house here at VAG Auto Care Services. 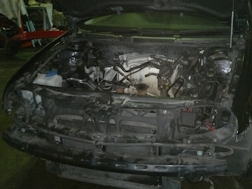 This is a customer car that we have been maintaining and upgrading since the owner purchased the car in 2009. In our hands this car has evolved from a standard car to a highly tuned normally aspirated setup and finally into a HGP GT-30 Turbo charged setup. The car is fully modified, running very similar chassis modifications to our GT-35 Turbo car - lengthened ratio 02M gearset, Bilstein coilover suspension, polybushed all around, HPA short shifter, adjustable rear tie arms for camber correction, Audi B7 RS4 front brakes and upgraded Neuspeed Anti Roll bars. The chassis modifcations are needed to support the phenominal power output of the HGP GT-30 turbo charged setup we installed on the car - this car is producing approximately 450 BHP. This car was purchased by one of our regular customers from a car breaker that had removed most of the higher value items from the car and was in the process of breaking it and had our customer not purchased it, this car would have been scrapped / crushed. 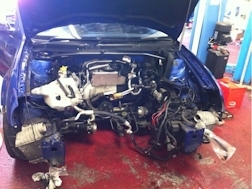 It was a low mileage, one owner example that was written off by an insurance company because unfortunately it's original 3.2 engine had been severely damaged (hydrolocked). 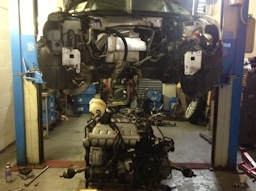 The car was purchased with many items missing including: Engine, Gearbox, ECU, Wheels, Lights, Bumper. 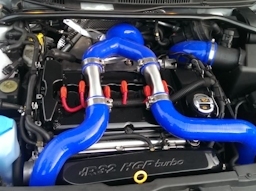 Our customer decided to build this car as a daily driver and opted to have an Audi 1.8T 225 engine fitted. 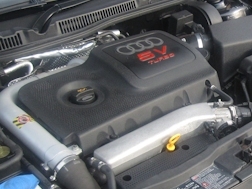 We performed the full conversion - installing the 1.8T engine / quattro gearbox into the car and getting it up and running , including the 4 wheel drive system. 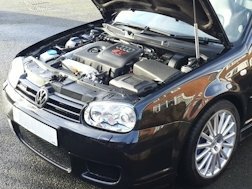 The customer wanted the car not to be a "show / race" car but to be as close as possible to a standard factory specification R32 1.8T - as if VW / Audi had produced it themselves, looking totally OEM. On top of this to bring the performance of the 1.8T up to the standard of current sports hatchbacks we fitted various performance upgrades including a 3" down pipe / sports cat which was custom mated to an R32 Milltek sports exhaust, R32 DSG air intake, supersize Turbo Inlet Pipe and the car was remapped and produced a very smooth 275 BHP / 314 FT LBS. This car was voted "Car Of The Year 2016" on the UK-MKIVS.NET car enthusiasts website.